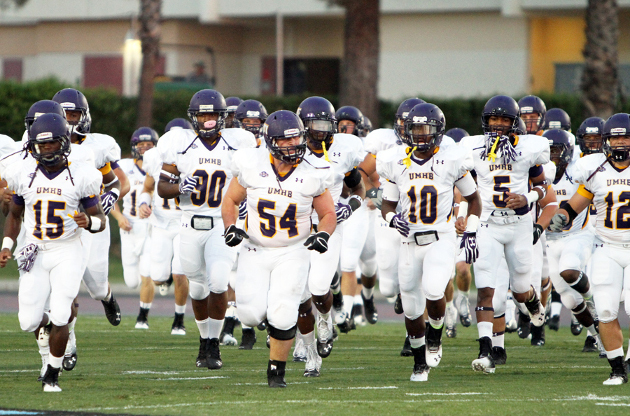 BELTON – The University of Mary Hardin-Baylor went unbeaten this season in the American Southwest Conference and were awarded 22 spots on the 2013 ASC all-conference teams on Wednesday. Senior defensive tackle Silvio Diaz was voted Defensive Player of the Year and also took Defensive Lineman of the Year honors, senior punter/kicker Chad Peevey was voted ASC Special Teams Player of the Year, senior running back Elijah Hudson was named to the ASC Outstanding Sportsmen of the Year Team and head coach Pete Fredenburg was named ASC Co-Coach of the Year. UMHB received 10 first team selections, 5 second team picks and seven that received honorable mention. Diaz leads a Cru defense ranked #1 in the country in rushing defense and he also broke the ASC career sack record this season. He is the third straight UMHB defender to win ASC Defensive Player of the Year honors and is just the fourth player in conference history to sweep Defensive Player of the Year and Defensive Lineman of the Year honors. Peevey is averaging 41.1 yards per punt this season including a school record with a 79-yard punt. Diaz and Peevey were were joined on the All-Conference First Team defense with senior defensive end Korey Steward, seniro linebacker Andy McAteer and senior defensive backs Cody Jones and Brodrick Crain. Hudson is joined on the All-Conference First Team offense by sophomore slot back Marcus Wimby, senior guard Josh Holt and senior tackle Montana Duncan. Junior linebacker Deshon Kinsey was a second team selection on defense joined by offensive selections junior tight end Eric Nelson, junior center Sterling Cantue, sophomore quarterback Zach Anderson and freshman kicker Drew Owen. Junior wide receiver Kamray Runnels, junior offensive tackle Jose Ostos, freshman linebacker Baylor Mullins, sophomore defensive tackle Lamar Seels, freshman defensive end Teidrick Smith, junior defensive back Eric Allen and senior cornerback Derek Williamson earned honorable mention honors. This is the fourth ASC All-Conference selection for Peevey. This is the third ASC All-Conference honor for Diaz, Hudson and Steward. Crain and Jones are two-time All-Conference selections. The other UMHB players earned All-Conference honors for the first time. UMHB will advance to the NCAA Division III National Championships for the tenth straight year and the Cru will open the postseason with a 12:00 PM home game against the University of Redlands this Saturday at Crusader Stadium. The Cru has won at least one playoff game in each of the last nine years and UMHB joins Mount Union as the only two Division III programs in the country to have accomplished that feat.